A website mainly targeted at Microsoft enthusiasts is shutting down and it appears this has been partly caused by pressure from Microsoft. Due some information on the website it became confirmed that Microsoft is working on a Windows version that supports foldable devices. The website administrator has removed all content and replaced it with an explanation of what happened. The website is called BuildFeed and mainly posts build strings of Windows versions. To be clear, website only lists versions and does not offer the actual Windows versions for download. However, some of the build strings can reveal upcoming features coming to Windows 10. Over the weekend a list of builds was leaked with references to rs_shell_devices_foldable_dev1 and rs_shell_devices_foldable. Some media picked up that string and started to report that Microsoft is working on a Windows 10 version that supports foldable devices. According to the owner of BuildFeed, the strings were submitted/posted by a Microsoft employee. 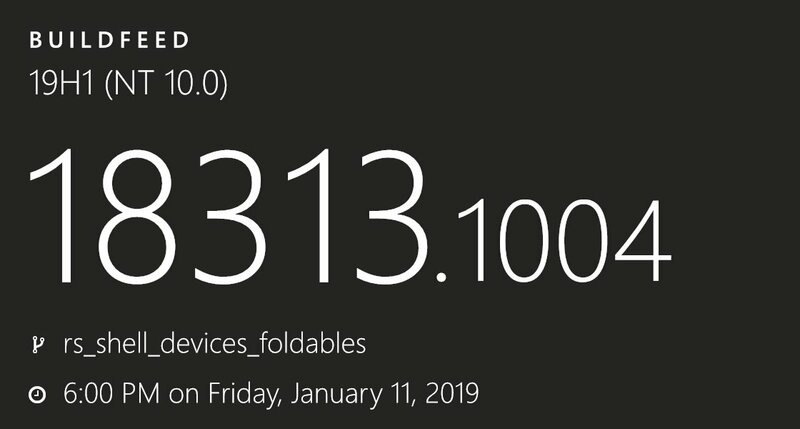 It’s not entirely news that Microsoft works on support for foldable devices for Windows 10. It was already rumored several times that Microsoft is working on such devices and even the code name “Andromeda” already leaked. Besides Microsoft, also other companies, like Intel, work on foldable devices. The chip giant already showed a working dual screen foldable prototype. It’s obvious that such hardware needs support from software and therefore it was very likely Microsoft would be adding support for foldable devices to Windows 10. Nevertheless, the build strings revealing Microsoft is currently working on adding support for foldable devices in Windows 10 apparently caused some stir, after which the owner of BuildFeed, Thomas Hounsell decided to shut down his site. Those who now visit the site are presented with a rather lengthy statement explaining the closure. While at first that might indicate that Microsoft has not been a reason for closing the site, it appears that Microsoft indeed did not put pressure on Hounsell directly, but that the company might have put pressure on any other person or company providing services to BuildFeed. One that first comes to mind would be e.g. their hosting provider. Maybe someday Hounsell will provide more information on the external parties that were putting pressure on BuildFeed/ him and what they exactly did. For users that regularly visited BuildFeed and will miss the site, there’s hope. The source code is on open-source hosting website GitLab and Hounsell has provided a database dump with all data for download. This allows anyone to use the code and data to start a new website with the same functionality, under a different name.